Here are a few of the questions people frequently ask us. If you have further questions please contact us by phone or just stop by the range. Do I need to be a U.S. citizen to use the range? I have a fear of guns. How can I overcome it? How can my Law Enforcement department use your range? How about bottleneck caliber pistols? Can I share a lane? How much for a pass to the range? Will you have any competitions? 1. Do I need to be a U.S. citizen to shoot? Due to Federal ATF regulation, any person admitted to the range MUST be either a citizen or permanent resident of the U.S. The only exemption is an individual who can present a photo ID passport from one of the listed countries on the Visa Waiver Program. These countries are as follows: Andorra, Australia, Austria, Belgium, Brunei, Chile, Czech Republic, Denmark, Estonia, Finland, France, Germany, Greece, Hungary, Iceland, Ireland, Italy, Japan, Latvia, Liechtenstein, Lithuania, Luxembourg, Malta, Monaco, Netherlands, New Zealand, Norway, Portugal, San Marino, Singapore, Slovakia, Slovenia, South Korea, Spain, Sweden, Switzerland, Taiwan, United Kingdom. Unfortunately if you are not a citizen, or a permanent resident, and you do not have a Photo ID passport from one of the listed countries we are legally prohibited from allowing you to use our range. 2. I have a fear of guns. How can I overcome it? This is not uncommon, but we have amazing instructors that can help you through it. Like a fear of dogs, chainsaws, or knives, can come from television, movies, stories, and personal trauma, so too can a fear of firearms be established. Maybe someone let you shoot a gun that was way too big for you, or you or a friend personally experienced a firearm related trauma. We are happy to say that we have helped a good number people overcome this fear, and some of our favorite regulars are a result. 3. Can my Law Enforcement department use your range? Certainly. Just have a decision maker from your agency contact us and we’ll work out the details and schedule. 4. Do you allow private bookings? Sure! The cost is $30 a head, and that gets you. If you want the place to yourself, we offer it Monday-Saturday outside of our normal business hours. We do require a non refundable payment of 10 shooters to staff the booking. If you just need a 2-3 lanes we can do that Mon-Fri during normal hours, but still require payment of 10 shooters to staff the event, and reserve the lanes. 5. Do you allow rifles? 6. Do you allow Shotguns? Yes, however you must use slugs. 7. How about bottleneck caliber pistols? Yep, we allow those, too. 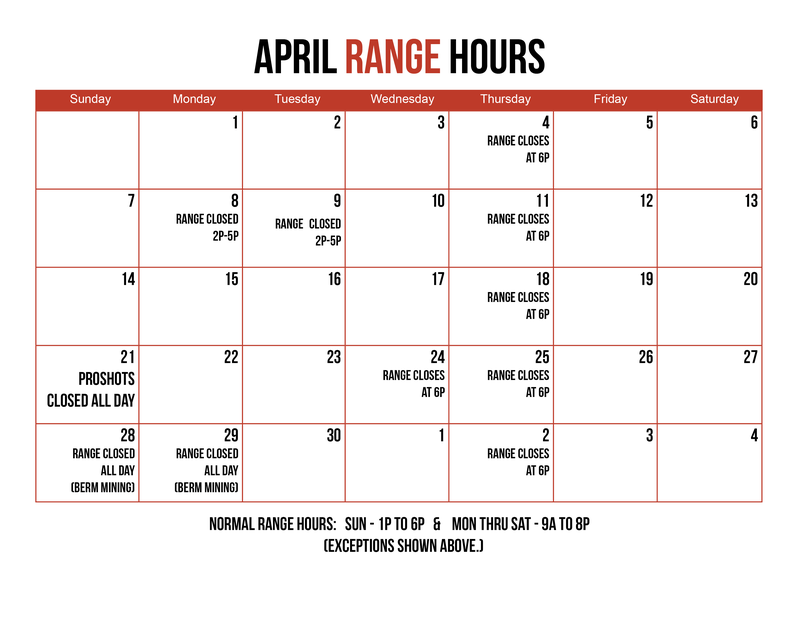 Currently, Monday thru Saturday, 9am-8pm, but keep in mind, Our range closes at 6:00 on Wednesday and Thursday to host our many events and classes. We also host Private Security and Law Enforcement qualifications at odd times, so you may want to check out calendar, or give us a call. We send out our calendar as a part of our weekly email. Next to US Highway 52, ten minutes north of downtown Winston-Salem. 10. How old do I have to be to shoot? Any age is welcome, provided they are with a responsible supervising shooter 21 years of age or older. 11. Can I share a lane? Sure, as long as all safety rules are observed, and only one person shoots at a time. 12. How much for a range pass? A range pass is good for one day, and without time restriction unless we are at peak volume. If peak volume is met we will start an hour rotation. $10 any day of the week, for current or military/LE or veterans. $10 for kids15 and under. Members shoot free any time. 13. Will you have any competitions? Yes. We already have and will continue to. Keep an eye on the calendar of events for dates and times. 14. Do you sell ammunition? Absolutely, and lots of it. We’re here to help. Contact us and we’ll answer your question as soon as possible.